21-year old guard Innocent Ochera (G-97) had an amazing evening in the last round for Ndejje Angels and receives a Interperformances Player of the Week award for round 16. He had the game-high 33 points adding three rebounds for Ndejje Angels in his team's victory, helping them to beat KCCA Lions (#10, 6-16) 77-71. Ndejje Angels is placed at 6th position in Ugandan league. Ndejje Angels is a typical solid league team placed somewhere in the middle or a little bit lower in the standings. They need more victories to improve their 10-10 record. In the team's last game Ochera had a remarkable six three-pointers out of 12 attempts. He has many years of experience at Ndejje Angels, through which he has constantly improved. Ochera has impressive league stats. He is in league's top in points (2nd best: 14.8ppg) and averages solid 2.3spg and 55.9% FGP. Second best performed player last round was Ethienne Kazungu (F-80) of league's second-best KIU Titans. 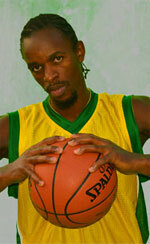 He is DR Congolese forward in his 2nd season at KIU Titans. In the last game Kazungu recorded impressive double-double of 12 points and 17 rebounds. It was enough for KIU Titans to edge the lower-ranked Our Saviour (#9, 7-12) by 5 points 54-49. KIU Titans' second position in the standings has not changed. His team lost just four games this season, while they won 17 matches. Kazungu is well-known at KIU Titans and he already established his position as one of the team's leaders. Third place about best performers goes to Brian Ssentongo (C/F-87) of Our Saviour (#9). Ssentongo scored 18 points and grabbed twelve rebounds (!!!). Despite Ssentongo's great performance Our Saviour lost 49-54 to the higher-ranked KIU Titans (#2, 17-4). But his team cannot count on just a single player as he also needs help of the other teammates. The chances of Our Saviour not to end season at such low position in the league, however are less than slim as they have already lost 12 games, recording just seven victories. With bigger assistance of his teammates, Ssentongo could try to bring Our Saviour's a little bit higher in the standings. Ssentongo has a very solid season. 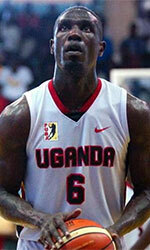 In 18 games in Uganda he scored 8.6ppg.